Gloucester Harbormaster Thomas Ciarametaro, right, and an officer with the Massachusetts Environmental Police watch from the dock as a group of men right an upside-down boat Monday at the Dun Fudgin Public Boat Ramp in Gloucester. Four members of an area family were passing under the Blynman Canal in the small boat at mid-day when the wake from another boat caused water to wash over the bow of the skiff, capsizing it. 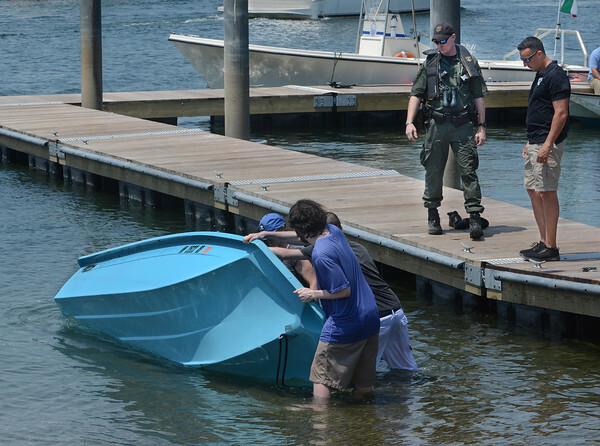 The boaters and their upside down skiff were carried about 250 yards by the current before they were rescued near the Dun Fudgin ramp by responders from the harbormaster's office and the environmental police. No one was injured.